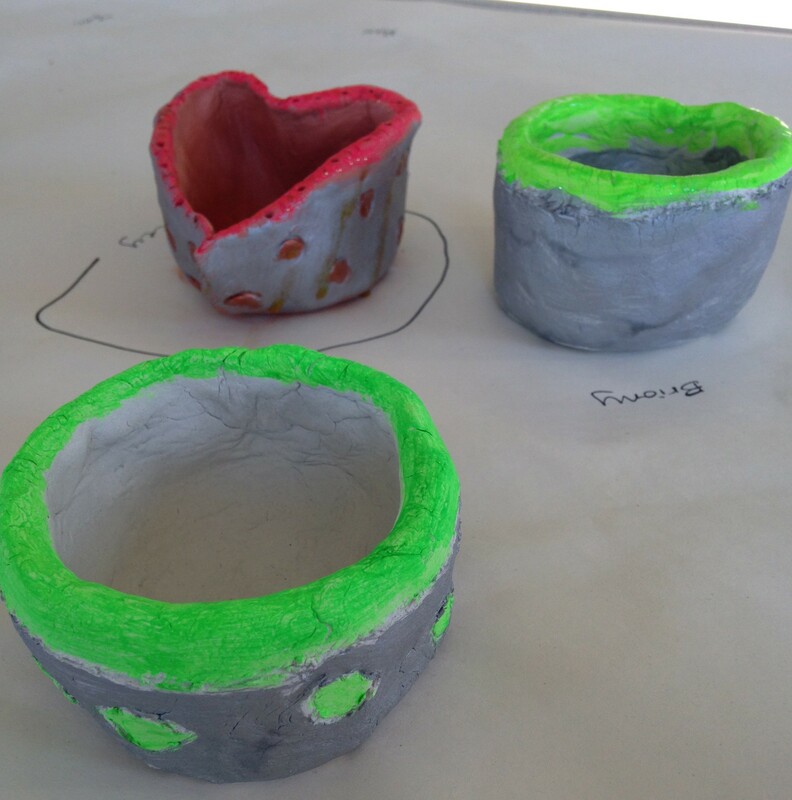 This week my students have enjoyed sculpting and painting mini pinch pots for their mums in anticipation of Mothers’ Day. We used Das air dry clay in both white and terracotta and I allowed for roughly 200 grams of clay per student. The instructions for the pinch pots were very straightforward, we simply rolled the clay into a ball then stuck in our thumb to create a hole. Then, by holding the clay in one hand and turning it constantly, we were able to use our other hand to thin and even out the edges of the pot. Some students were especially creative and turned theirs into heart shapes or their mother’s initial. Others used tools such as wooden skewers and texta lids to make patterns and marks in their designs. 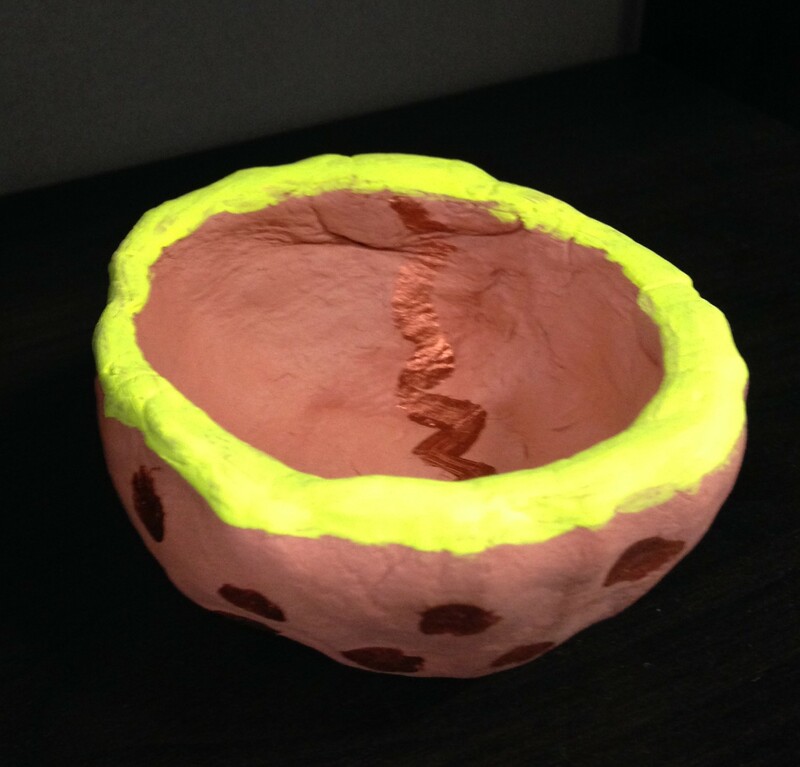 I was able to discuss connections with this project and our new science unit ‘Materials and Their Properties’ by teaching new vocabulary such as ‘malleable’ and ‘pliable’. It’s always nice when topics are interrelated! After two days of drying (the weather has been cold lately) we were ready to paint. 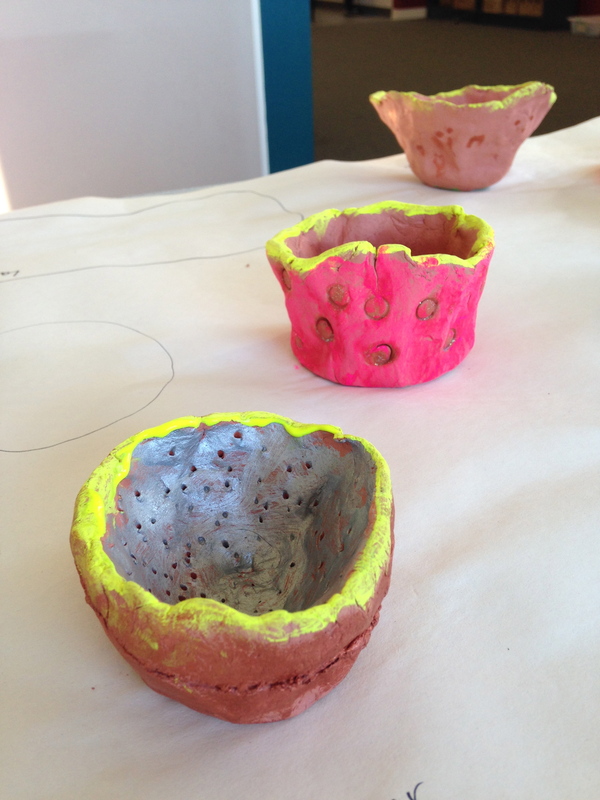 We opted for neon colours as well as some beautiful metallic copper, gold and silver paints. There were some beautiful results! 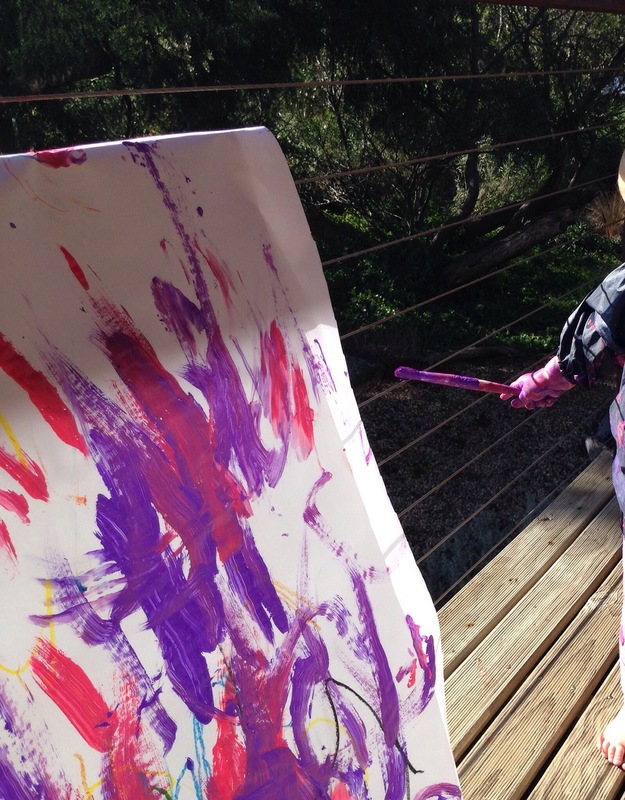 This Easter is a little different from others… Because now I have a toddler! Evie is almost 2 and right into anything messy. 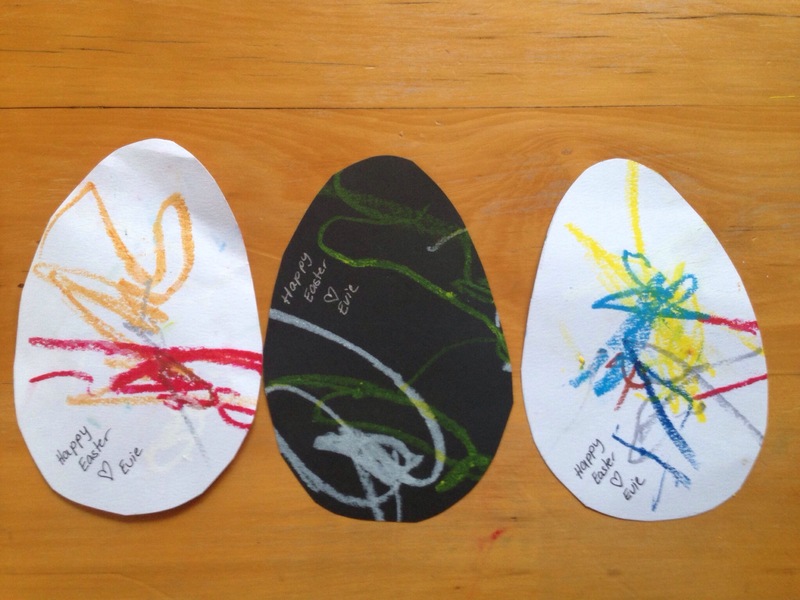 My aim today was to create a few Easter drawings for her great grandparents. We ventured into painting with brushes and using the most fabulous drawing product I’ve come across, Crayola Twistable Slick Sticks. Painting was great fun but wow it covered me, her and the deck! The crayons were a delight and although a little messy they were so smooth to draw with. The slightest touch and they produced beautiful marks. Crayola suggest using them on all sorts of surfaces. I experimented with them on tin foil and they shimmer; perfect for Rainbow Fish art? Might try that at school. There’s always one child who says their mother doesn’t actually drink tea, but for the majority of the class this crafty little card seems to work a treat. We had a selection of gorgeous paper designs available and encouraged the students to choose a contrasting colour for the card background. We gave them a template for the teacup and had to remind them to leave the top of the teacup unglued so the teabag could be poked into the pouch. Pardon the pun (and the misplaced apostrophe). Adds to the cuteness factor though I believe.